After the week we have had with the Connecticut school shooting and the resulting anti-gun cacophony from the left that believes more laws on more paper will really, really, truly make criminals stop all their bad behavior (because the libs said so), here is a story that illustrates simply and succinctly why Americans that physically step up and answer a call are the real reason that change occurs. Jordon Pritchard, a honorably discharged marine, (no such thing as former), got up this past Monday morning, donned his marine uniform and has since stood outside his daughter’s elementary school as a way to ease her mind and has become quite the hero to other parents. If this behavior is not emulated all over the country, we’ll have much more to worry about then the squeamish, sanitized, liberal left in this country. A former Marine and father of two decided to help ease his daughter’s fears after the tragic school shooting in Connecticut late last week by standing guard outside her west Nashville school. Jordan Pritchard served eight years in the Marine Corps and was honorably discharged last May. Over the weekend, Pritchard said his daughter told him she was scared to return to school following the Connecticut tragedy. “As a dad, I can’t have that. I can’t have my daughter come to school worried about somebody coming in and hurting her,” Pritchard said. 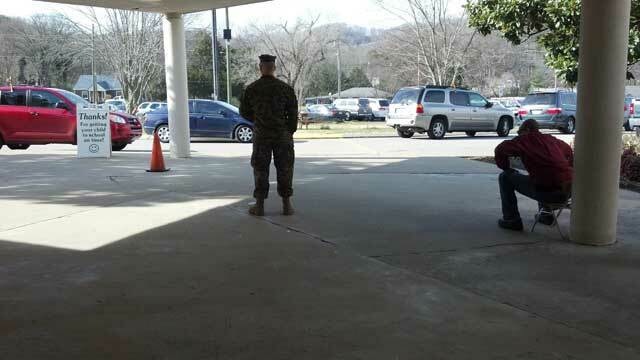 He added, “To settle her peace of mind, who better than her dad to come out here and stand in front of the school?” Pritchard told Nashville’s News 2 he dusted off his Marine Corps uniform and has been standing guard in front of the school since Monday. Hit the link above to catch the video and read the rest of the story. It is this level of participation in a family and a community that makes the difference. Start thinking outside the box people, and stop asking for permission to do the right thing. HUGHSON, Calif. — A Marine veteran of Iraq and Afghanistan took up self-imposed duty in front of a central California elementary school in the wake of the Connecticut shooting. Hughson Elementary School Principal Laura Fong said Sgt. Craig Pusley stood all day Wednesday in fatigues in front of the flag pole at the school just southeast of Modesto. He was not armed. Pusley, who served two tours in Iraq and one in Afghanistan before leaving active duty last year, told Fong that “he wanted to make the kids feel safe in light of what happened at Sandy Hook Elementary,” the principal said. 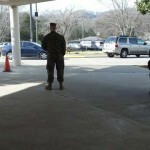 The veteran Marine arrived at the K-3 school a little before 7:30 a.m., Fong said, and asked permission to stand guard. He stood in front of the flag pole until 2:30 p.m., she said, without taking any breaks. Pusley is the father of a 3-year-old, and his wife is expecting another child. He told the Modesto Bee that he decided to take action after reading a Facebook post urging soldiers to be posted at every school in the wake of last week’s tragic shooting in Connecticut. Fong said Pusley is returning Thursday, the school’s last day before the holiday break. Hello LM!!!! Glad to see you here again!